Campbell, a recipient of the 1986 Cleveland Arts Prize, passionately records the human figure and its social context. 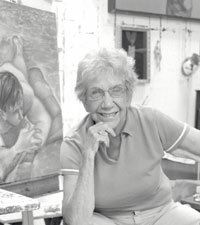 Since the beginning of her career in the 1940s, her style has changed from figurative expressionism to total abstraction; and since the 1970s, from hard-edged realism toward freer, more painterly realism-sometimes incorporating collage elements. Regardless of her style, her art consistently reflects her superb drawing skills and commitment to life drawing. Campbell’s art explores the vast range of the human condition. She paints strippers, celebrities, hookers, politicians, bullfighters, burlesque queens, alcoholics, and motorcyclists. Pursuing her subjects with the intensity of a reporter, she travels to observe people performing daily tasks in familiar surroundings, interviews them, and fills page after page with sketches. Despite the obvious opportunity for social or political commentary, she focuses on the common humanity of her subjects and presents each with individual compassion.